Since the release of the initial version of subtasks, we have been overjoyed with all the customer feedback this feature has generated. It has been widely and rapidly adopted by Azendoo users, with one subtask created for every two tasks. 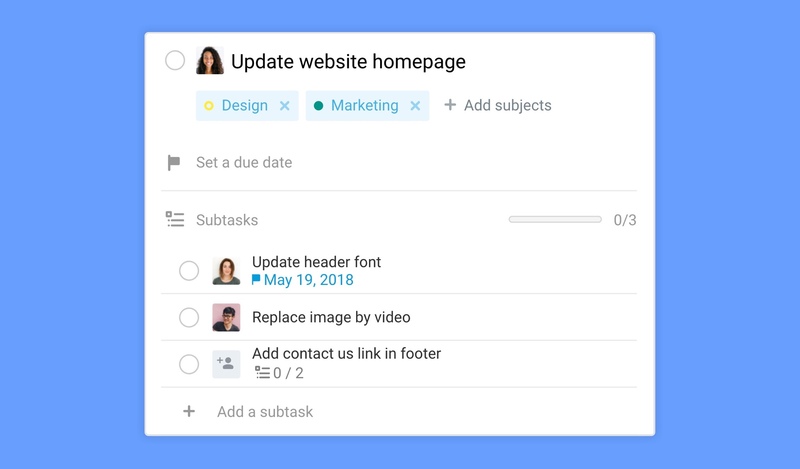 Subtasks were meant to help you break down your work into small bits of actions, and to give you more depth in terms of how you organize your work. The first version did the former but failed in the latter. That’s why we wanted to go further with this feature, as many of you suggested. 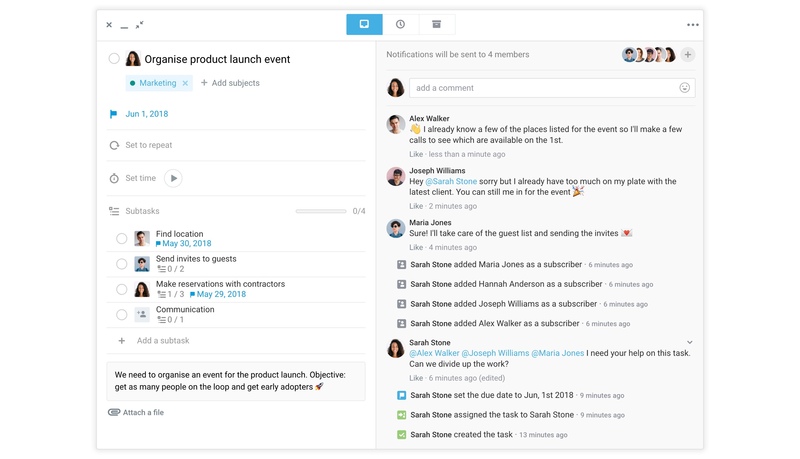 With this new update, subtasks are now fully functioning tasks and can therefore be opened, assigned, shared etc. Basically, you can do everything you can do with a regular task with them. This opens up many possibilities in terms of work organisation for you and your team, and will make tasks more interconnected to pass on even more context and facilitate your work. Open up a task and start creating tasks inside the subtask section. Then simply click on one of your subtasks to open its task card. Subtasks are just like regular tasks in many aspects. But they also have their own specificities. 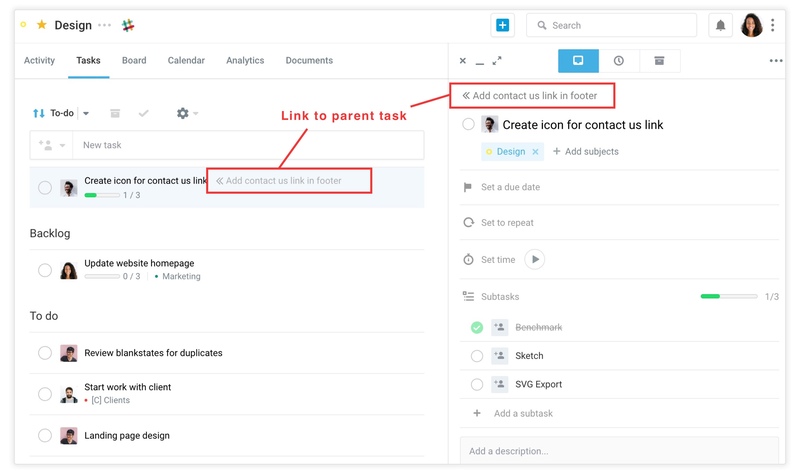 The most notable one is that you can open the parent task by clicking on the parent task label displayed on the top of the task. The same link is available in task lists to give additional context to subtasks. Just like regular tasks, subtasks can be shared on subjects. The subtasks will then appear on the subject's task list and task board views. You can assign the subtask directly from the parent task card by clicking on the avatar icon and selecting the assignee in the dropdown menu. You can also change the order of the subtasks in their parent task card at anytime with a simple drag & drop. Mark subtasks as completed from the task card or from the list and board views like you would on any other task. And yes, subtasks can also have their own subtasks! You can create an infinite number of subtasks. This can help to break up big tasks into smaller chunks and divide the work among your team. 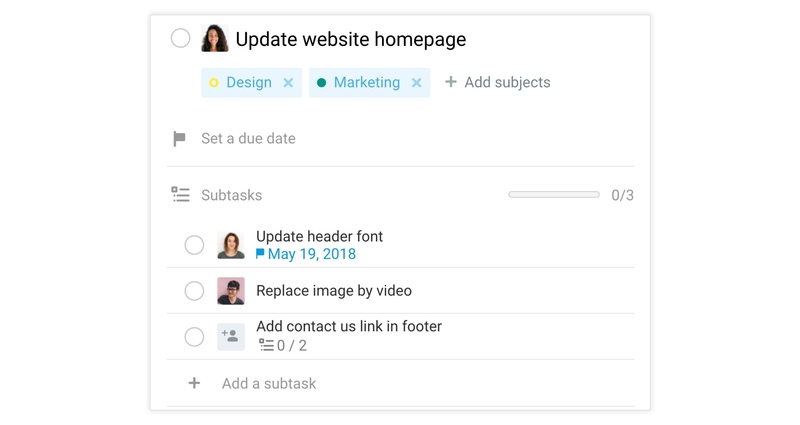 To make the change feel practically invisible, all of your old subtasks are now available in the new format so you can start taking advantage of the new possibilities right away. 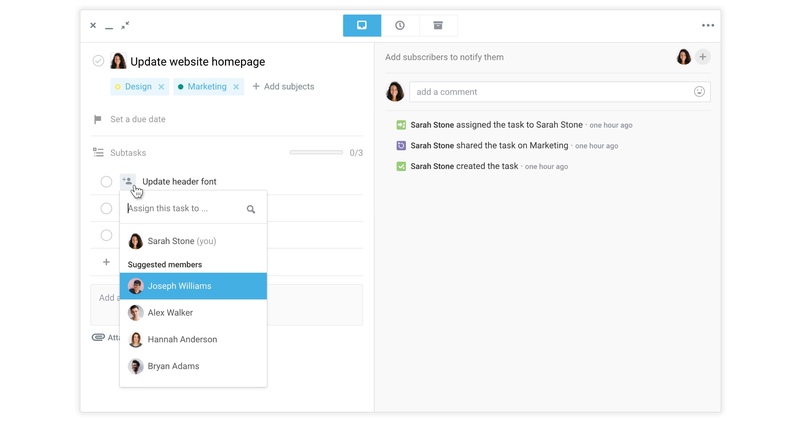 For more information about how the new subtasks affect other features, read our dedicated help article. You can start using the new subtask possibilities right away with your current tasks. Assign yourself all subtasks so that they appear in your to-do list or board. If you were used to frequently changing task assignees when a task needed multiple contributions, you can instead create subtasks and assign them to the other contributors. This way everyone knows what they need to do and can plan their workload accordingly. It can be tough to keep seeing the same task in your to-do list for weeks. To break that negativity, unassign the long-term task and create shorter-term tasks that you can assign to yourself instead. You'll check off more tasks and increase your motivation to make a meaningful impact on the long term. For mini-projects that require multiple contributors and tasks shared in multiple subjects, the best thing to do is to set up a rule. Have someone create the parent task (corresponding to the mini-project) and make sure that all related tasks are created as subtasks in order to centralise all information. Then list all of the action items and assign subtasks to the appropriate team members. Add additional information to each subtask so that everyone is clear on what needs to be done. The mobile app has received a mandatory update to make sure everyone is on the latest version and can use subtasks on the go. Next up are start dates on tasks, a faster and even more reliable Azendoo, as well as some surprises. We hope you enjoy all of the new possibilities thanks to this major update. Stay tuned for more meaningful changes coming soon in Azendoo.